There are several reasonably priced hotels near Port Everglades, giving you and your family an opportunity to enjoy the rich life of Fort Lauderdale before or after your inclusive Caribbean cruise. To be clear, when we say Port Everglades we are talking about the cruise port in Fort Lauderdale. One other thing to note is that Port Everglades is not a part of what is famously known as the Florida Everglades. The cruise port is located on the southeastern coast of the Florida peninsula within the three cities of Fort Lauderdale, Hollywood and Dania Beach and the unincorporated Broward County. Port Everglades is approximately 23 miles north of Miami and 48 miles south of West Palm Beach. 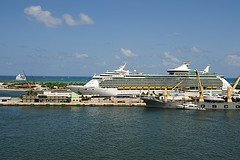 It is understandable that so many people seek hotels near Port Everglades annually - it is a highly popular Caribbean cruise port. Did you know that the world's two biggest cruise ships - Oasis of the Seas and Allure of the Seas - sail from the Ft. Lauderdale cruise port? The top Caribbean cruise lines offering cruises out of Port Everglades are Carnival Cruise Lines, Celebrity Cruises, Disney Cruises, Holland America and Royal Caribbean International. You can find Eastern Caribbean cruises, Western Caribbean cruises and even Southern Caribbean cruises leaving from Fort Lauderdale. The main reason many people book Ft. Lauderdale hotels before sailing from Port Everglades is number of fun things to do in the city. For more information on Port Everglades/Fort Lauderdale attractions, click here. Now that you know some of the things that you can do in Ft. Lauderdale, let us look at some hotels near the cruise port. 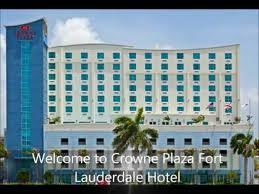 The Fort Lauderdale Hyatt's address is: 2301 SE 17th Street Causeway, Fort Lauderdale, FL. Hotel Guest Rating: 4.0 out of 5. 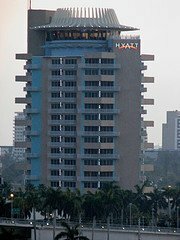 The Hyatt Regency offers shuttle service to and from the Fort Lauderdale International Aiport, which is located about 3 miles from the hotel. 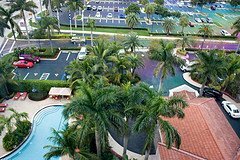 Additionally, the Hyatt's location is close to popular attractions such as Billie Swamp Safari, Beach Place Shopping and Entertainment Center, Stranahan House, and the Bonnet House. In addition to the Hyatt's airport shuttle service, there are public transportation options available. The Renaissance Hotel is located at: 1617 Southeast 17Th Street, Fort Lauderdale, FL. Hotel Guest Rating: 4.3 out of 5. The Renaissance Hotel is ideally located 15 minutes from the Fort Lauderdale Airport and is in close proximity to popular attractions in the city: countless white sand beaches, the Beach Place Entertainment Complex, the Los Amos Riverfront Entertainment District, Dolphins Stadium, the Broward County Performing Arts Center, the Blockbuster IMAX Theater, Hard Rock Casino, and the Galleria Mall. There are several public transportation options available near this Port Everglades hotel. These are just two of many hotels near Port Everglades. You can get additional information about each of these plus find other hotels by using the TripAdvisor Search Box below. Cruise passengers should choose to fly into the Fort Lauderdale-Hollywood International Airport (FLL), which is less than 15 minutes from Port Everglades (Fort Lauderdale Cruise Terminal) and neighboring hotels. Alternately, Caribbean cruise passengers may fly into Miami International Airport (MIA), but this is about 45 minutes from the Fort Lauderdale area. The fact that Port Everglades is just 5 miles from the Ft. Lauderdale Airport makes it easier to find reasonably priced transportation to the cruise terminal and nearby hotels. 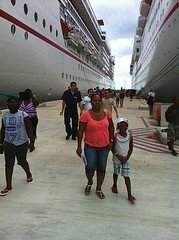 Cruise passengers can choose to use public transportation, taxi service, or shuttle service. $22.00 for 2 people; $25.00 for 3 people; or $32.00 for 4 people. Roundtrips are also available. You may reach Fort Lauderdale Shuttle at 954-525-7796 or 1-866-FUN-RIDE. Note: All prices above are subject to change. We hope that we have helped you and yours as you consider staying at hotels near Port Everglades before or after your inclusive Caribbean cruise.